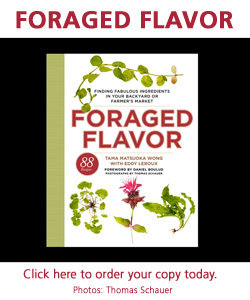 It is in a fact a truly noxious weed, as defined by the US government, an invasive plant. It spreads by underground rhizome (the underground parts grow roots) and each little piece, if broken off, can form a new plant. It can take over landscapes, crowding out native flora and forming a army monoculture of bamboo looking jointed stems. Also known as “Mexican bamboo” this plant is originally from Asia, in Japan it is known as itadori, the tigers stick, and in fact once it matures, it is woody and stiff like a strong stick. 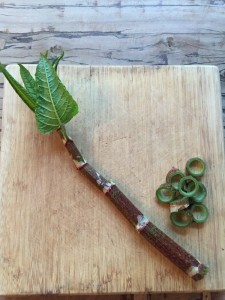 But when young and tender before the leaves branch out, it is a delicacy for the Japanese and here, in the United States it is a delicious advent of spring. Because this is an invasive plant, harvesting must be very careful. In New York City and State you must have a license to transport, possess or sell the plant, due to its invasive qualities (yes, we are licensed). NEVER plant it in your yard or elsewhere!! You will be spoiling the land for generations to come. Place the clean knotweed pieces in a mason jar. Boil the rest of the ingredients and pour over the knotweed. Let sit until room temperature and store in the refrigerator for up to a month. We love it with pork belly and rice, Asian style.